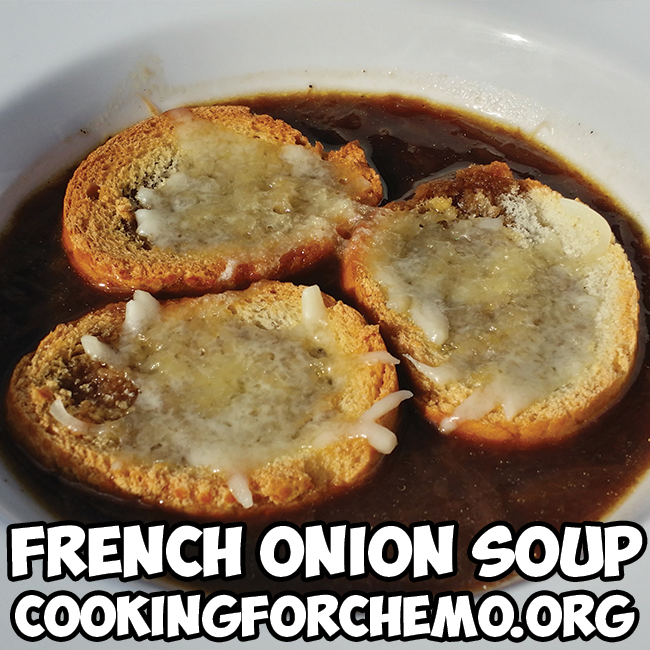 French onion soup is a classic French recipe loved the world over. Rich savory beef broth, caramelized onions, crunchy croutons, and melty Swiss cheese create a symphony of decadent flavors. In France, onion soup is used as a hangover cure after a long night of wine drinking. Good for people with low to moderate side-effects. Best categorized as classic French. Heat a large spaghetti pot with a lid over medium heat. melt your butter and add onions, pepper, and kosher salt. Toss onions and butter together until completely mixed. Cover with lid and allow to cook 15 minutes. Toss the onions and butter together again until the bottom onions are now the top onions. Repeat these steps until onions are thoroughly soft and caramelized. When onions are translucent, begin adding wine a few ounces at a time. Mix the onions and the wine together and allow the wine to almost cook completely out before adding more wine. Repeat this process until the entire bottle of wine has been added and reduced. Repeat this process again with one quart of beef stock. Take care to not allow beef stock or wine to burn as this will carry a smoky smell through the entire soup. After wine and beef stock have been reduced, add remaining beef stock, sugar, red wine, and bay leaf. Allow to simmer 30 minutes for optimum flavor. Onion soup should be very rich and savory. Look for a touch of sweetness with the addition of sugar. Not noticeably sweet, but a touch sweet for balance. Pre-heat your oven to 375 degrees Fahrenheit. Place baguette slices on baking sheet. Place sheet into oven and allow slices to dry out until they are almost completely brown all over. The purpose of this is to dry the bread out as much as possible. Dryer bread soaks up more soup and makes for a much more delicious experience. Ladle soup into a bowl, filling no more than 2/3 of the bowl with soup. Place a generous amount croutons on top of the soup. Cover croutons with a handful of grated Swiss cheese. Either microwave for 30 seconds, or place bowl under broiler to melt cheese. The key to this soup is the slow cooking of the onions and the slow addition and reduction of the wine and beef stock. This process is called “Au Sec.” This process reduces the water content and condenses the concentration of flavor. When you reduce the wine and stock, the end product should look like melted chocolate or fudge. Cooking for Chemo focuses on teaching you how to make your food taste good again during cancer and chemotherapy treatments. The flavor and cooking techniques contained within our easy to make recipes will help improve your quality of life as you go through cancer and chemotherapy treatments. Our cooking and flavor techniques can be integrated with any diet regimen. All of our recipes can be made with organic ingredients if you choose. Our holistic approach to cooking will help you not only be able to eat but to also enjoy the taste of your food again during and after cancer and chemotherapy treatments. We have many healthy recipes, crockpot recipes, chicken recipes, dinner recipes, shrimp recipes, pasta recipes, soup recipes, vegan recipes, salad recipes, vegetarian recipes, breakfast recipes, and even a great chili recipe. Talk with your oncologist and dietitian to come up with a quality nutrition plan. This site is not to be taken as or used instead of professional medical advice. Please consult your doctor, oncologist, and dietitian before starting any new diet. Chef Ryan Callahan is a classically trained chef with fifteen years of culinary experience. He is also the author of "Cooking for Chemo ...and After!" Chef Ryan acted as his mother's primary caregiver while she herself went through chemotherapy treatments.